Pat was felon-set by junior minister Douglas Hogg a member of the Conservative government of the time, who used parliamentary privilege to denounce him in the House of Commons. The decades after the death were marked by systematic efforts by the police and MI5 to cover up, lie and destroy evidence. A key witness, loyalist William Stobie, was shot dead. So the claim of “no overarching state conspiracy” is a lie on a grand scale – another bucket of whitewash over the corpse of Pat Finucane. But it is not the biggest lie. The big lie is the assumption of uniqueness of the Finucane case. What was unique about Pat’s murder was that he was an officer of the judicial system. His murder caused shockwaves across the world because it indicated that the British were instituting a full-blown state of siege. Other than that it was identical to hundreds of sectarian killings by Loyalists. Gangs of bully-boys had high grade intelligence, were able to move freely through the frequent roadblocks and it proved impossible to arrest them. When a few were arrested it proved equally difficult to convict them and when some were convicted extenuating circumstances led to light sentences. The police attitude to the Loyalist campaign was underlined when they invented a new term for sectarian killing. They labelled it “motiveless murder”. How could they prevent loyalist killings when they couldn’t even puzzle out a motive? The proper term would have been random murders. Covert operatives from the SAS carried out assassinations of IRA members. The Loyalists, local gangsters recruited, organised and armed by the British, were used were deniability was essential – as in the case of the Finucane murder and the Dublin and Monaghan killings. They were the weapon of choice for instituting a reign of terror that ate away at the mass working class base that represented the ongoing obstacle to stabilizing partition. If this were simply an historical issue then it would be largely an issue for the victim’s families. It is not. There are people scattered throughout the British security establishment who, by the admission of the government itself, are guilty of conspiracy to murder. There are others guilty of conspiracy to pervert the course of justice. No one can believe that the conspirators did not reach into the heart of government. Then there is the facade of reform. British representative Chris Patton paid an enormous bribe to retire a whole sector of the police, only to have them go through a revolving door and reappear as civilian advisors. But it is not only the Special Branch that was recycled. The Loyalist death squads have reappeared in the new “peaceful” society. Sponsored through bribes and grants, they have reappeared as community representatives – muscle to ensure that sectarian division is built into the fabric of civil society. Although guns are rarely used, loyalist violence remains common, as does a high level of impunity and police toleration. It is only weeks since Chief Constable Matt Baggot addressed the conference of the UVF front group, the PUP, and that was days after the UVF organised major riots in North Belfast and just before it organized further violence in Belfast. A key task for Britain today is to bury this past. Bloody Sunday is pinned on individual paratroops. 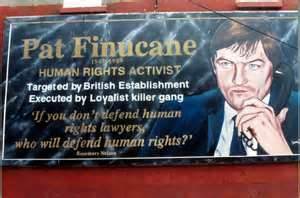 Finucane, it is claimed, is the fault of individuals in Special Branch and MI5. The reports of the local Historical Enquiries Team have been largely discredited. A Belfast coroner has moved recently to block investigations into the Ballymurphy massacre and other killings. The idea is to say sorry and move on. We should support attempts by the Finucanes and others to force broader and more independent enquiries as these can force open the contradictions of the British position and draw attention to the reality that still underpins the British presence in Ireland. We should not expect that any real movement will come from Sinn Fein, who are well established in the Northern administration, nor from a Dublin government that has never been able to confront the British role in the Dublin and Monaghan bombings. We should also recognize that no enquiry will change the reality of imperialist rule. That will require the regrowth of an anti-imperialist consciousness in Ireland and the recomposition of working class self-organisation in both Britain and Ireland.